The Indiana Jones films have a special place in the hearts of many a film fan. Their blend of action and humor, not to mention being helmed by what remains one of the coolest protagonists ever created, made them as close to perfect an example of the adventure genre as there has ever been. Stephen Hall has taken on the challenge of condensing three of the most beloved movies of our times into a single hour, performing all the characters himself. The result is a loving homage that captures the spirit of the original trilogy, but is not afraid to poke some fun. 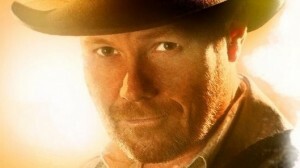 Hall blazes through the three Indiana Jones films at breakneck pace (We won’t speak of ‘Crystal Skull). The man has clearly done his research. His method of taking on the characters is stripped-back – there are no drastic changes of appearance, but through his mannerisms he manages to distill the essence of all the main players in a way that is immediately recognizable. Hall’s rendition of Dr. Brody was particularly great. Visually tricky sequences are handled in wonderfully lo-fi ways – the show’s solution to re-creating the iconic map sequences is hilariously simple. Hall keeps the energy up through the entire hour. He throws himself into the last chase scene with as much gusto as he does the first. It’s impressive how much of the plot is crammed into the hour. All the major story points are in there, and there are a few sly nods to things that had to be cut. Despite the cracking pace that the story needs to travel at to fit into the allotted time, it’s easy to follow. If you haven’t seen the Indiana Jones films, you would still get a kick out of the show. However, fans will get this most out of this. It’s an absolute joy to see the tiny little details that Hall has managed to weave into the show. ‘Raiders of Doom’s Last Crusade’ is a must-see for fans of Indiana Jones. Hall’s version is every bit a quick-witted and action-packed as the originals, and twice as funny. Stephen Hall – Raiders of Doom’s Last Crusade is showing at The Fringe Hub – Meeting Room at North Melbourne Town Hall until October 5. Previous Previous post: 5 Good Reasons to see 24 Hour HOO-HAA!